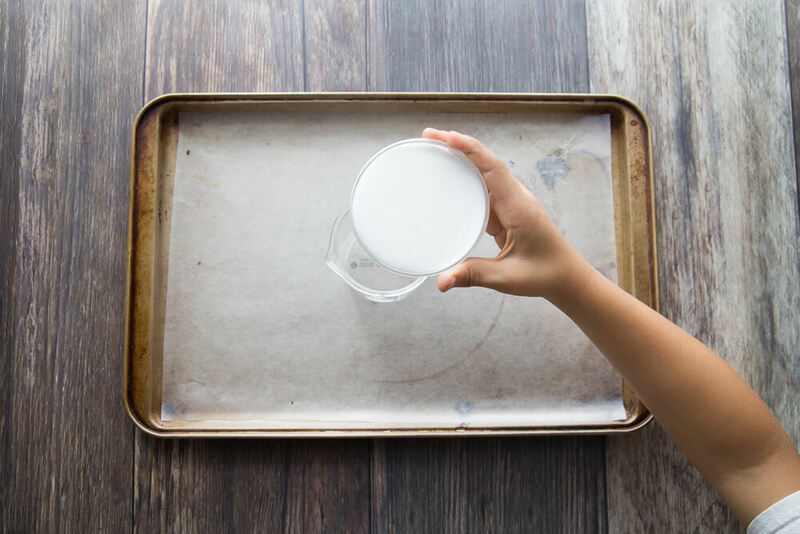 This is by far one of the coolest slime recipes we have to date because it combines two things we love: slime making and baking soda vinegar reactions. 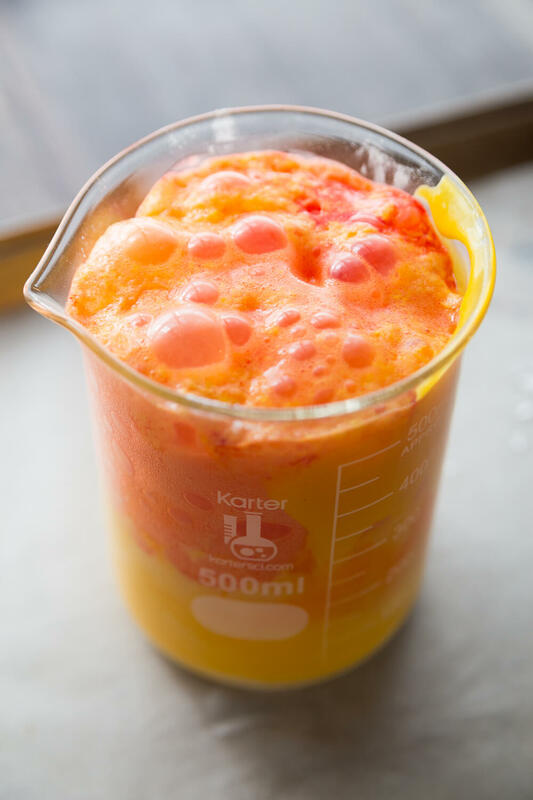 This fizzing slime volcano is a 2 for 1 chemistry activity for kids. Learn how to make a unique slime recipe while also experimenting with acids and bases! 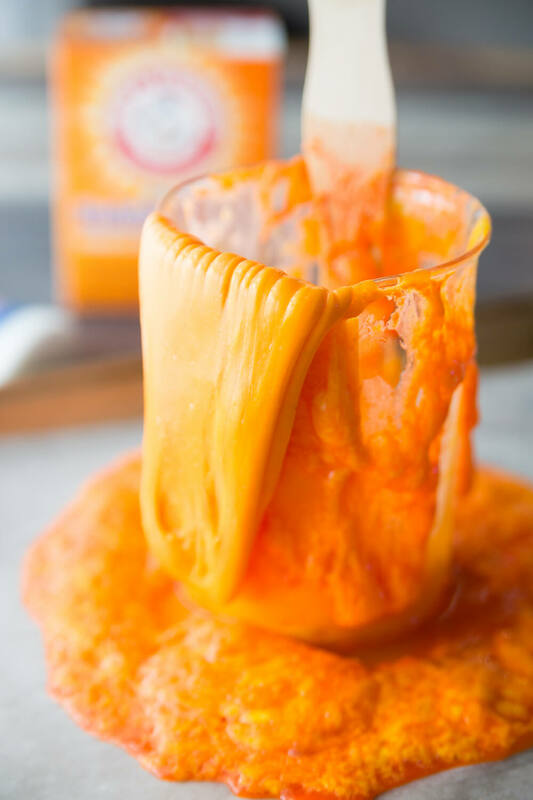 Kids are going to LOVE this slime experiment. Get ready for a real blast! This is slime making taken to a whole new level of slimy goodness! 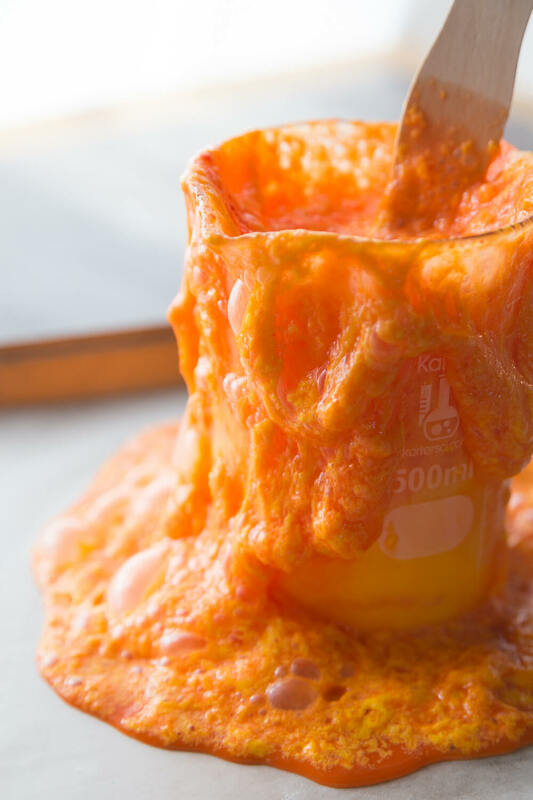 You are definitely going to want a cookie tray to catch this slime volcano eruption of bubbling and fizzing “lava”. Hands down, this is the best slime making fun we have had together. Why is that? Because we love anything that fizzes, bubbles, and erupts. This fizzing slime volcano has the definite oooh and aaah factor, but is also super easy to set up. A little messy, this lava slime is going to be a big HIT. 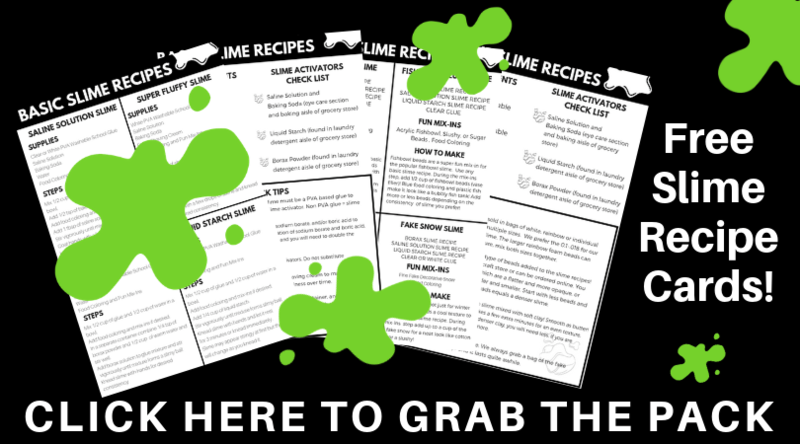 The recipe instructions and mixing are different than all our other slimes, so I recommend you read through the directions, tips, and tricks before you get started. As always the right slime ingredients paired with the BEST slime recipes is key! 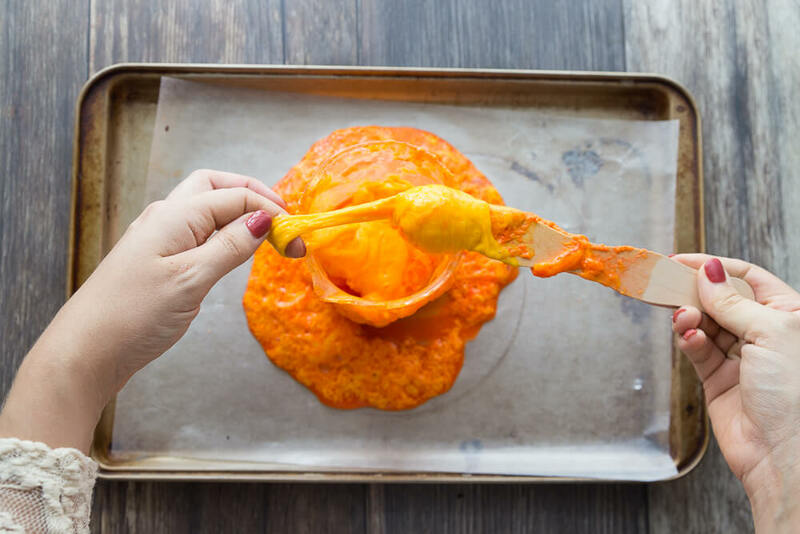 Note: The slime that is produced is fun and stretchy but definitely is not as high quality as our original slime recipe. Of course, making a lava slime volcano is half the fun. If you want a super awesome stretchy slime without a volcano, check out the original saline slime recipe here. What’s the science behind the slime? The borate ions in the slime activators (sodium borate, borax powder, or boric acid) mix with the PVA (polyvinyl-acetate) glue and forms this cool stretchy substance. This is called cross-linking! SLIME FOR NGSS: Did you know that slime aligns with the Next Generation Science Standards? It does and you can use slime making to explore states of matter and its interactions. Check out NGSS 2-PS1-1 for more information! Of course, there is an additional science experiment going on here which is the chemical reaction between the baking soda and the vinegar. When the acid and base mix together, they produce a gas called carbon dioxide. This is seen in the fizzing bubbling eruption that takes place when you stir the slime! Continue to explore states of matter too! Read more about our RECOMMENDED SLIME INGREDIENTS here. When looking for a good container for your fizzing slime volcano, find something that is on the taller side but with a wide enough opening to allow you to easily mix the slime as well. The nature of a baking soda and vinegar volcano is that the gas produced during the reaction pushes up and out. A taller and narrower container will yield a better eruption compared to a wider and shorter container. We like our inexpensive beaker set for fun science activities. See links below. STEP 1: Start by combining the glue and baking soda in your chosen container. You will notice that as you stir the baking soda into the glue it thickens! This is really the point of adding baking soda to saline solution slime recipes. SLIME TIP #2: Experiment with different amounts of baking soda! STEP 2: For our lava colored fizzing slime volcano we used red and yellow food coloring, but we didn’t make orange straight away. 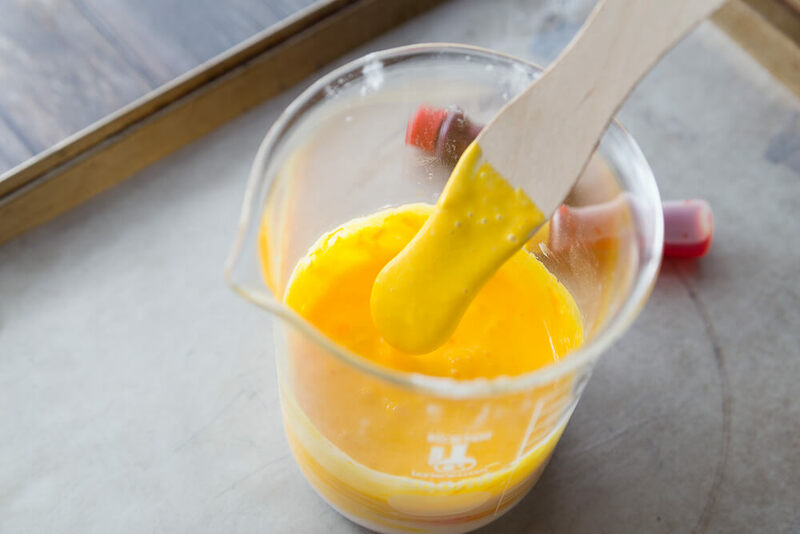 Add 5 yellow drops to the glue and baking soda mixture and stir. Then add 1-2 drops of red food coloring but DO NOT stir! This will give way to a fun color burst as you mix. You can make this slime volcano any color you want! Step 3: In another small container, mix the vinegar and the saline solution. SLIME TIP #3: You can also play around with the amount of vinegar you use for another way to set up a slime experiment! Step 4: Pour vinegar/saline mixture into the glue mixture and start stirring! You will notice the mixture begin to bubble and eventually erupt everywhere! This is the reason for the tray! Step 5: Continue to stir until the eruption is complete. You will notice that it gets harder and harder to stir because you are mixing your slime as well! Once you have stirred as much as possible, reach in and pull out your slime! It will be a bit messy at first but this slime is wonderful! All you need to do is knead it a bit. SLIME TIP #4: add a few drops of saline to your hands before you reach in for the slime! It should not be sticky on the hands either! 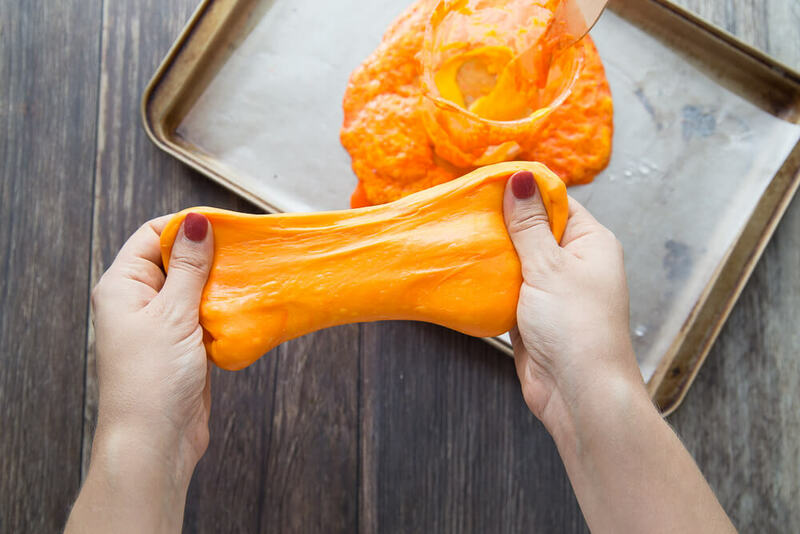 But if after kneading your slime it still feels sticky, you can add a drop or two of saline to it and continue to knead. Don’t add too much or you will end up with a rubbery slime! Go ahead and play with your volcano slime! Want more fizzy eruptions, check out our lemon volcano. What can you do with the leftover slimy eruption on the cookie sheet? You can actually play with it too! We added a squirt of saline to it and had some fun messy slime play. It makes a great popping sound when you squeeze it due to all the bubbles from the reaction that are left over! As I mentioned above, the slime that is created along with the fizzing slime volcano is not necessarily something that will save for weeks. We found it got a bit watery and not as nice the next day. The whole slime volcano activity itself is AMAZING! It’s a MUST try for the slime making and science experiment to-do list. COOLEST FIZZING SLIME VOLCANO EVER! 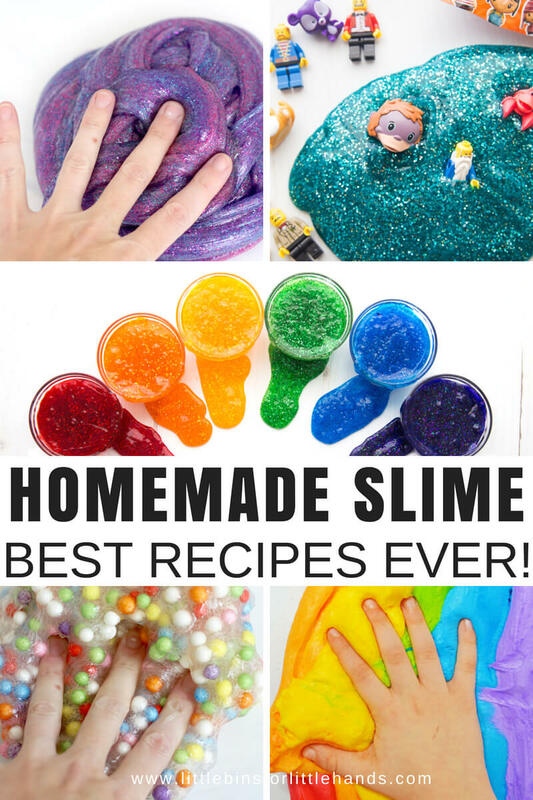 Check out the BEST slime recipes and ideas. See our whole collection here including fluffy slime, cloud slime, crunchy slime, and so much more!